If you’ve just moved into your new house and have decided in choosing Roman Blinds as your choice of shutters, let me congratulate you on a path well chosen. Everyone who has put their faith in utilising Roman Blinds has not had their trust misplaced. Let’s look at some of the advantages Roller Blinds have over any other type of window covering. Roller Blinds are made up of a single piece of material that stacks up into evenly sized panels when raised and courses into a single smooth piece when lowered, providing it with a very clean, classy look. For the creative individual, roman blinds present you with the opportunity to create your very own design on its magnificent canvas. Imagine what people around you would say, if they came over for a house party, and you lowered your blinds and a drawing of your very own creation stood there with its head held high. An immense number of colours, designs, patterns, materials and arrangements await you in the world of Roman Blinds. With so many options, it’s a cinch finding something that goes well with your room. There are very little things in this world that suit your desires. This is one of them. Roman blinds are the epitome of function simplicity. They operate using a single cord which raises or lowers the blind, depending on the direction that you turn. This allows you to control how much sunlight or privacy you want. Goodbye unwanted glares! 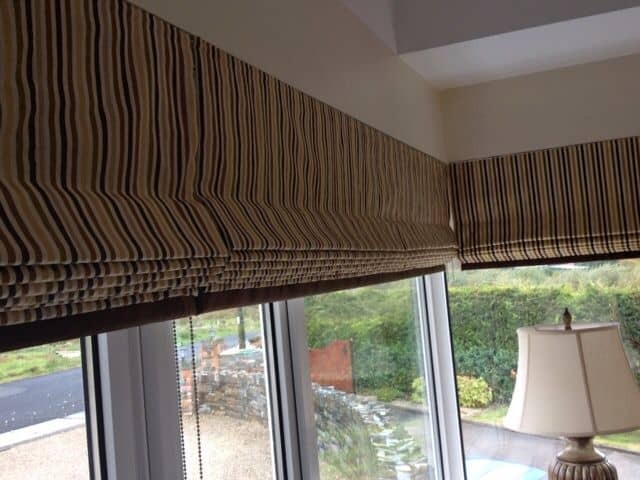 Fabric Roman Blinds – These are the ones you see most commonly on displays and showrooms. They provide a homey and inviting feeling. It makes everyone feel comfortable. They do need a bit more care though because if they are not cleaned regularly, clumps of dust will accumulate in the folds of the fabric. You don’t want to leave a shabby and unkempt impression on your guests do you? Bamboo Blinds – Imagine you’re in a lush green forest, the rushing water sounds of a river beneath your feet, birds chirping in the distance and a waterfall cascading at your back. You take a deep breath and feel your lungs filling up with crisp, fresh air. You exhale and feel every single worry leaving your body and mind. A smile can’t help but make its way to the corners of your mouth. You’re at peace. Now imagine being able to have that feeling every time you come home? You know what to do. Cordless Roman Blinds – Save you the hassle of having to deal with entangled cords. If you’re worried about the cords messing with the beauty of your blinds, then worry no more. Cordless Roman Blinds are here to save the day. Talk about making a simple thing even simpler.